Have you guys eat scone before? It's basically a pastry similar to biscuit but it has a rich, bread-like texture when you eat. Scone is most known taken during breakfast or as a snack preferably with coffee. You can serve scones with butter, cream and jam or just eat them plain - still taste so good. I bought a buttermilk from Tesco last weekend and thought of trying some random recipes using it as a main ingredient. So here's one - homemade buttermilk english scones. The very basic scone formula but using buttermilk instead of whole milk to bind all the ingredient together. Mind you that these scones make your house smells like a bakery shop when they are in the oven hehe. The ingredient for making scones are very flexible. For example, by adding combination of milk & orange juice for your moistener, adding oats, chocolate chips, or some dash of cinnamon to give them extra flavour. The end result is up to you! In this recipe, I just cut out some raisins and dates. p/s; this recipe is vegan! eggless! 1. Preheat oven 200 degree celcius, line a baking sheet paper. Set aside. 2. Take a bowl and combine flour, baking powder, baking soda, salt and sugar. Give them some whisk. 3. Add in butter, mix it well using a pastry blender or spoon or your hand until they look like coarse crumbs. Make sure that your butter is cold. 4. Mix in vanilla extract to your buttermilk, raisins and dates into your flour mixture. Stir just until the dough comes together - do not overmix (Like what I did, LOL. I sightly over mixed them), or just until no dry ingredients left. 5. Transfer dough to a lightly floured surface and knead the dough gently. Role it into 1 inch (2.5 cm) thick. 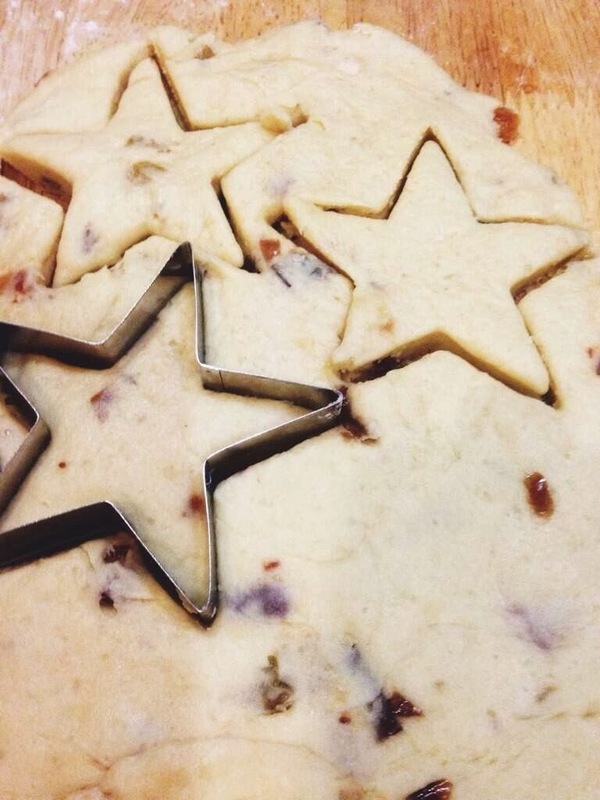 Cut the dough into triangle, circle or your choice of shape and transfer them onto baking tray. I used my star pastry cutter and they still hold their shape after baked! 6. Brush on top of scones with a little milk (optional). Bake scones for 18-20 minutes or until golden brown and a toothpick inserted at the center comes out clean. These are best served warm, soon after they bake or can store them in an airtight container for several days - reheat a bit in microwave if you want to eat. Best served with butter & jam or nutella, just because nutella makes everything taste better. lol. kakakakakakakakkkkk!! macam sedap je??? aku nakkk.